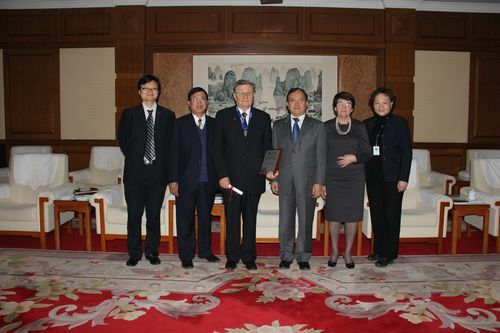 On 23, Feb. 2013, the Awarding Ceremony for 2013 Award for International Scientific Cooperation of CAS was held in Beijing. Professor Geliy Zherebtsov recommended by National Space Science Center won the 2013 Award for International Scientific Cooperation of CAS. The other two recipients of the award are Professor C.N.R. Rao and Herbert Jaeckle from India and Germany respectively. On the Awarding Ceremony, Professor BAI Chunli, President of CAS, delivered the medal and certificate to the recipients, and extended congratulations to the recipients. Professor Geliy Zherebtsov is the former Director of Institute of Solar-terrestrial Physics, Siberian Branch, Chinese Academy of Sciences and Co-director of Russia-China Joint Research Center on Space Weather. He has actively involved in the Russia-China cooperation for more than one decade. Geliy Alexandrovich Zherebtsov, born in 1938, is a renowned Russian space physicist, also known as one of the founders of Space Weather in Russia. He is a Full Member of Russian Academy of Sciences with more than 240 publications in academic journals. He was awarded the Order of Service to the Fatherland, Order Sign of Honor, and Medal for Valorous Labor to Mark Centenary of V.I. Lenin, due to his prominent contributions to scientific research. He once served as Deputy Governor of the Irkutsk Region for science and technology policy. In the past decade, Professor Zherebtsov, as the Director of Institute of Solar-terrestrial Physics, Russian Academy of Sciences (ISTP, RAS), constantly dedicated himself to promoting the scientific cooperation between CAS and RAS. It is of mutual benefit for ISTP, RAS and National Space Science Center (NSSC), CAS to establish scientific cooperation in the field of Space Weather. Under the promotion of Professor Zherebtsov, RAS and CAS jointly established Russia-China Joint Research Center on Space Weather. Within this framework, scientists from both sides engaged in active academic exchanges. As of 2012, the joint center was granted more than 20 collaboration funds, published over 80 papers and organized 11 bilateral workshops. Up to date, almost all the major institutes of space weather in Russia are involved in the scientific exchanges. 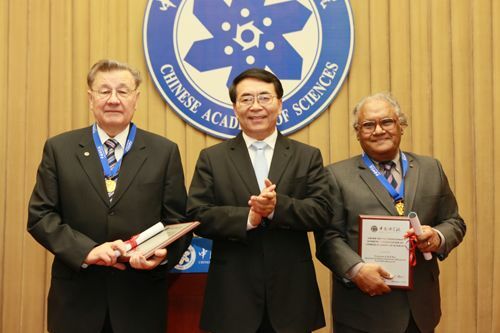 Professor Zherebtsov facilitated the signing of the third Agreement and Charter for Russia-China Joint Research Center on Space Weather between ISTP and NSSC in April 2012, paving the way for cooperation in the next five years. Moreover, Professor Zherebtsov actively promotes the ground based observation data exchange and supports the extension of International Space Weather Meridian Circle Program (ISWMCP) to the North by taking the initiative to sign the ISWMCP Agreement with CAS. Currently, he is devoting himself to Russia’s participation in the Kuafu Program, a mission in CAS Strategic Pioneer Program on Space Science, to deepen Russia-China cooperation in the field of Space Weather.